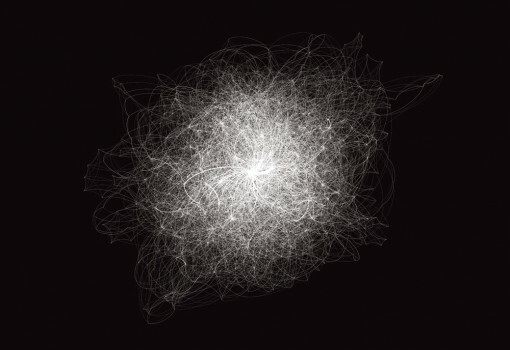 We now offer high quality large-format prints of network visualizations created using a combination of our own software (Textexture), open-source Gephi platform, iterative algorithms, fuzzy logic, trial and error, as well as intuition, magic, science, and experiment. 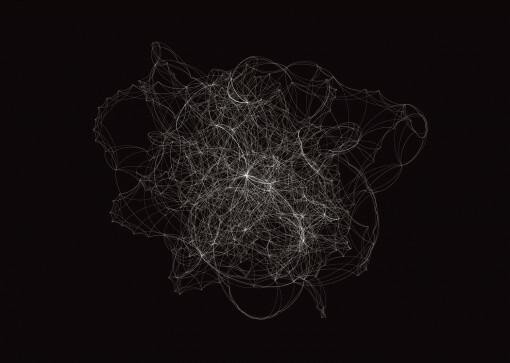 It is possible to order prints of the already existing text network visualizations or to create custom-made prints using your own source data (any text, social network, or any other connectivity that can be represented as a network). Objective: Abstract representation of networked connectivity. Italo Calvino once said that reading as “a way of exercising the potentialities contained in the system of signs” and writing is a “combinatorial exercise”. If we were to take any vocabulary and use the words in a random fashion, then even if we follow the rules of grammar we would end up with a blue dog that similarly de!nes the identi!cation of credit lucky above the derived bread take and so does the right making it into something that doesn’t really make sense. There are certain words that we tend to use together more often than others and the reason is that we want to communicate above the sea level of white noise nothingness something that is meaningful in some sort of way. Of course, obfuscation can also be a good strategy to slow down perception and introduce a different methodology into the process of making sense, but in the end there is still a certain intention on the side of the author that expresses itself through the narrative – the “combinatorial exercise” that Calvino was talking about. We developed the practice of textual polysingularity to bring this intention contained within the narrative into light, as well as to expand the field of potentialities that can be unlocked through reading. The basic premise is to use network analysis to interpret a text as a graph. The words are represented as nodes and their combinations are the connections between them. Once we start thinking of text as a network, we can apply various tools from graph theory to detect combinations of words that tend to occur more often, find the threads of meaning circulation, expose the parts of the text, which are the junctions for narrative turns and contextual changes. The resulting diagram can also be used as a tool for non-linear reading: instead of following the narrative the way it originally unfolds, we can teleport ourselves into any point of it that is the most relevant to us and then continue the movement according to our own interest, while staying loyal to the original structure. In order to bring this practice from theoretical realm into something a bit more tangible, we created an online tool for text network visualization www.textexture.com freely available for anyone to use. Textexture translates any text into network, which can then be used to get a quick visual overview of the main topics, as well as to navigate to the parts of the text that are most relevant to the reader. The Polysingularity Network Prints presented here express a more abstract aspect of this endeavor. The intention here is to zoom out and to look at certain regularities and irregularities contained within the structure of the multiplicity as a whole. These images can be seen as attempts to discover the inner structure of text in a way that is personal, rather than objective. To imagine a text as an amalgamation of energy resulting from the narrative patterns that emerge when the time is conflated. A text that carries a certain kind of transformative power in its own very specific way, which is also very subjective to every person who comes into contact with it. The process of creating each image is something very subjective, so if you would like to try it with a text or any connectivity that is important to you, feel free to use www.textexture.com or to contact us. We can then either make it for you or we can do it together, making all the adjustments and choices collectively. Whichever way you choose, the most important thing is that the resulting image will be something that is relevant to your personally. The source material can be anything: from a literary work you like or an e-mail exchange with your lover, to the graph of your Facebook friends or your current ideas in their interconnectedness.